Packaging colors & types may vary. These electronic editions are made as there is a need for them. All books are shipped with either a clamshell, slim-line or full jewel case. Many disc faces will be label printed, rather than direct on-disc printing. Shipping usually occurs within six days of order. BIDDLE - Samuel Biddle Family History and Descendants, by William Curtis Stoner, Jr. and Girtha Lee Boydston Stoner, CD, PDF*, 750+ pages, includes photos, documents, maps, etc. ER048-$70.00 | Also available in print. COCHRANE - The Cochrane and Ripley Families, by Ann Cochrane Gregath & Fredrea Gregath Cook, 1993, 2013, 8½x11", 292 pages, indexed, includes photos, documents and maps. Includes families of Cochrane, Downing, Furgeson, Garringer, Hite, McClay, Ripley, Scott, Truman and others. Click here for more about the book. 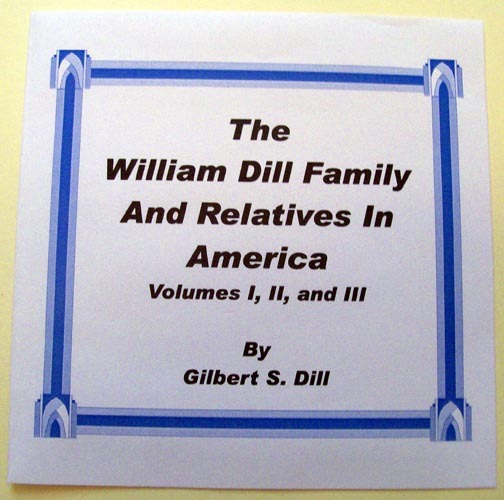 DILL - The William Dill Family and Relatives in America, by Gilbert S. Dill, 1999, CD, PDF*. "William and his brother, John, arrived in America sometime around 1715 or 1720 from Donegal County, Ireland. They came to Kent County, Delaware. Some of his children went west, in search of land. After a time, William resettled to South Carolina." The 3 volume set was originally published in 1993, in a very limited quantity. The set, initially in excess of 2,500 pages, has been typeset and blank line spaces have been deleted (1,526 pages -1996 revision). Further Information | EG145-$80.00 Complete printed set also available. DUSKY And Allied Families - The Families of Dusky, Finney, Gallimore, Gladfelder, Green, Hill, Lanning, London, McQuown, Neufang-Knifong, Reed, Wasley-Wesley and Whitaker, by Ann Cochrane Gregath, 1991. 8½x11", CD, PDF, 214 pages, indexed, includes photos, documents, maps, and charts. EG872-$35.00 Click here for more about the book. This interface has been known work incorrectly. Call us at 918-542-4148, or email us to request direct PayPal billing. 1900 BLOUNT County, Alabama Census Index, by Gregath Company, Inc., 2010 digitized version, CD - PDF*, searchable with correct acrobat version with correct acrobat version. 8½x11", softbound book, 20 pages. EG675-$12.00 Also available in print. 1880 CULLMAN, Alabama Census, by Ann Cochrane Gregath, 1977, revised edition, 1980, 2010 digitized version, CD - PDF*, searchable with correct acrobat version, 8½x11", 76 pages, Commemorative of Cullman Counties first 100 years. EG720-$12.00 Also available in print. CULLMAN County, Alabama 1900 Census Index, by Gregath Company, Inc., 2010 digitized version, CD - PDF*, searchable with newer acrobat versions, 8½x11", 20 pages. EG721-$10.00 Also available in print. ST. CLAIR County, Marriages 1818-1899, by Rubye Hall Edge Sisson, 2011 E-edition. 8½x11", CD, PDF - searchable with newer acrobat versions, 284 pages, indexed. Originally published in 1990, this 1997 reprinting brings back this work to print. This nearly 300 page book includes a full name index. Includes full name listings for both Bride and Groom. Date and other notations such as parents, connector, buried, funeral, death, age, etc. accompany them. ER863-$20.00 Also available in print. From Trout Creek to Ragland, A History of Ragland, ST. CLAIR County, Alabama, by Rubye Hall Edge Sisson, 1989. CD, PDF - searchable with newer acrobat versions, 145 pages, indexed, includes photos. This history holds a wealth of information. This indexed volume includes several photographs. Chronicling various facets of the community including industry, churches, schools, recreation, and many families. ER865-$20.00 Also available in print. LESLIE County, Kentucky Deaths - 1995, by Margaret B. & Richard E. Sampson, 1997. CD - PDF*, searchable with newer acrobat versions, 110 pages, indexed, cross-referenced. EG065-$10.00 Also available in print. Marriage Book 1, LESLIE County, Kentucky 1878-1885, by Margaret B. & Richard E. Sampson, 1997. CD - PDF*, approx. 100 pages, indexed, cross-referenced. EG066-$10.00 Also available in print. WYANDOTTE - Journal of the Wyandotte (Oklahoma) Legislative COMMITTEE, by Ann Cochrane Gregath. CD - PDF*, 36 pages, transcription covers 9-27-1848 to 10-25-1856. EG626-$10.00 Also available in print. TOURING Washington DC, by Carrie Ann Cook, 1999, 2000. 8½x11", CD PDF*, 32 pages, includes information on all major attractions. G549-$6.00 | FREE on Smashwords | Also available for purchase in print. EASTERN SHAWNEE - Expanded Index of the Eastern Shawnee Census, Per Capita Rolls and Lists of Guardians and Administrators, by Gregath Company, Inc., CD - PDF*, 28 pages, Enlarged index of census, per capita rolls and list of guardians and administrators January 1872-October 3, 1902 Quapaw Agency-Census. EG585-$5.00 | Also available in print. QUAPAW - Expanded Index of the Quapaw Tribal Census and Issues, by Gregath Company, Inc. CD - PDF*, 14 pages, (Quapaw Agency) Census April 12, 1873-July 15, 188_. EG605-$5.00 Also available in print. SENECA - Expanded Index of the Seneca Census, Annuity Rolls and List of Guardians and Administrators, by Gregath Company, Inc. CD - PDF*, 22 pages, December 30, 1873-October 3, 1902 Quapaw Agency-Census. EG610-$5.00 Also available in print. SHAWNEE-CHEROKEE - Index to the 1889 Roll of the Shawnee Cherokees, by Gregath Company, Inc. CD - PDF*, 24 pages. EG625-$5.00 Also available in print. Expanded Index to Various WYANDOTTE Tribal Rolls Between the Years 1872 and 1884, transcribed by Ann Cochrane Gregath & Carrie Ann Cook. CD - PDF*, 36 pages. EG627-$10.00 Also available in print. PDF* - EG/ER# books include bookmarks within each file and a cross-linked Table of Contents and can be read with the FREE Adobe Acrobat Reader program.